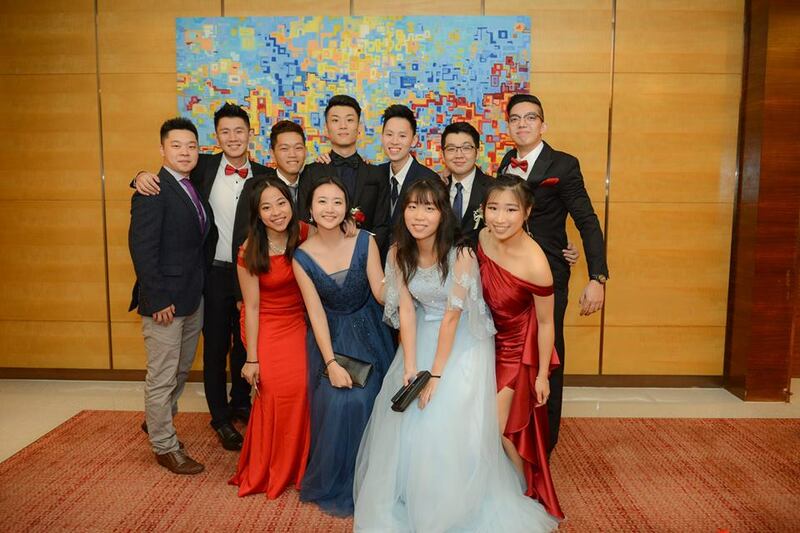 A ball is a magical night when girls and boys dress up in fancy, flowing gowns and well-fitting tuxedos and make memories (usually by means of a front camera) which they will cherish for the rest of their lives. 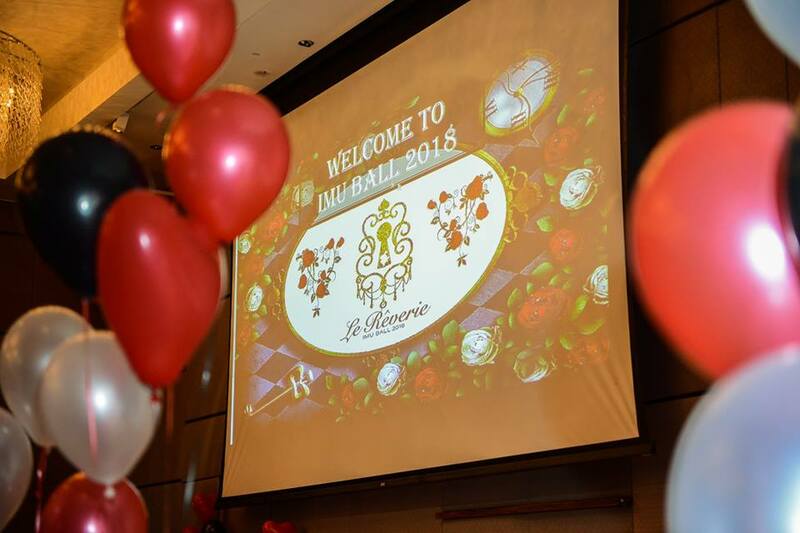 This year, IMU Ball 2018: Le Rêverie was organised by an enthusiastic student committee in hopes that both the students and staff of IMU would seize this opportunity and get a well deserved break from their busy university and working life. 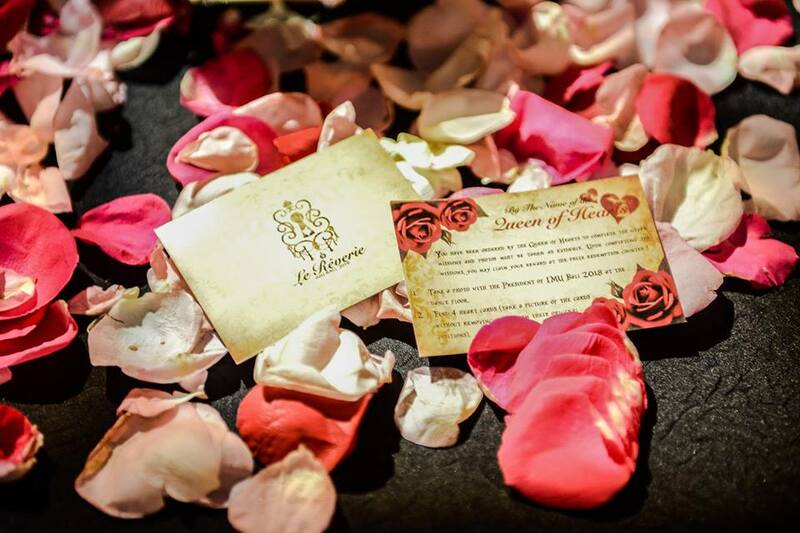 The event was held at DoubleTree by Hilton Hotel in Kuala Lumpur on 23rd of March 2018, and themed ‘Alice in Wonderland’. The ballroom was filled with bright flowers and petals, exquisite decorations and other Wonderland-style flourishes that added to the experience of transporting ball-goers to Carroll’s fictional world. 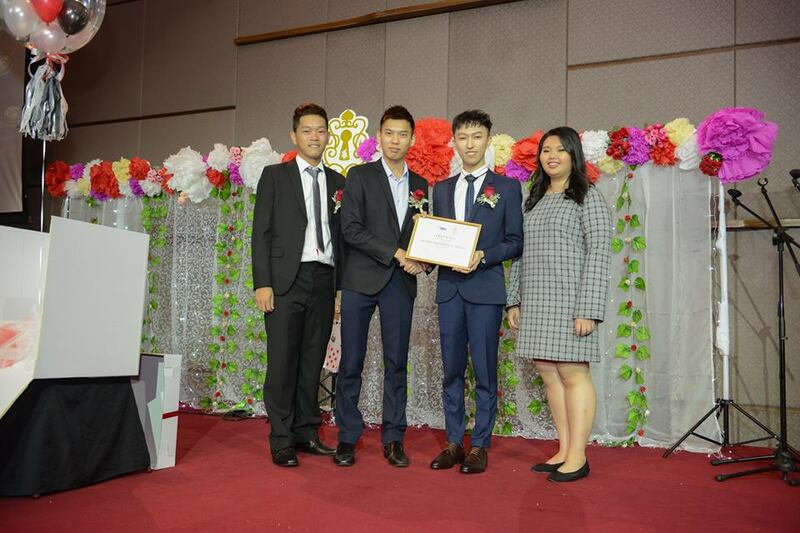 The evening commenced with the emcees inviting onto the stage Mr. Chan Jie Yong, President of IMU Ball 2018, Mr. Eric Ngu and Ms. Chow Wai Hoong, Vice Presidents of IMU Ball 2018, and Mr James and his colleagues as representatives from AK Group Holdings, the main sponsor of the event, for an opening ceremony. This was then followed by a brief welcoming speech by the president. 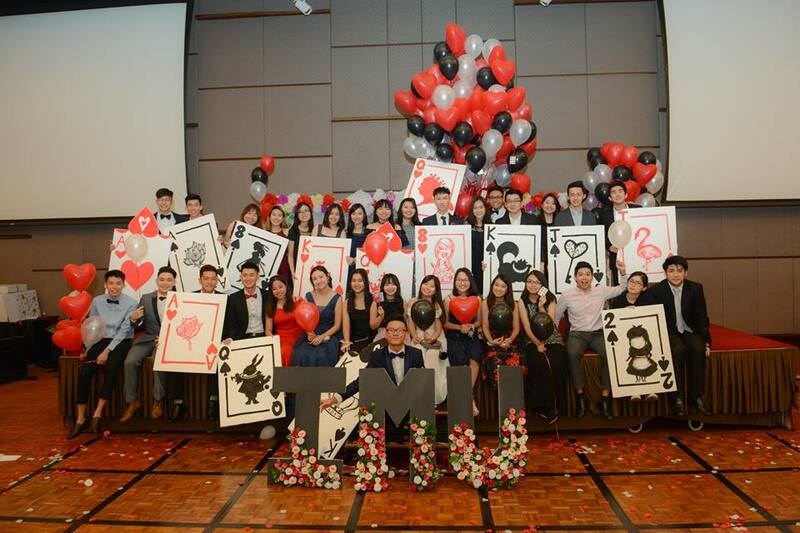 He stated that the idea of making IMU Ball 2018 a social event for both students and staff, for the first time, allowed them to interact and engage with one another in a more relaxed setting. He also expressed his gratitude to all sponsors, especially AK Group Holdings, and to all members of IMU staff, all the committees, as well as all the students and lecturers for supporting this event and making it a success. 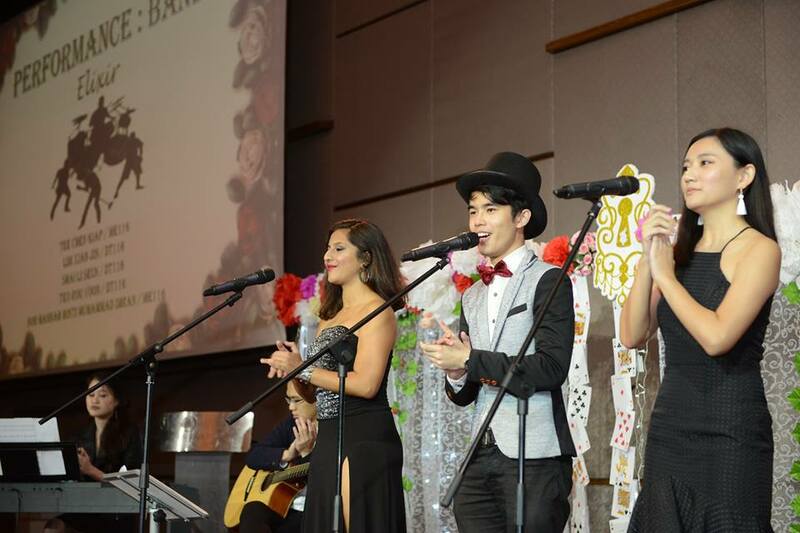 The real fun began when Elixir and Singaholics performances, their melodious tune adding to the atmosphere. This was followed by a performance by Jacky, a talented pianist from BM1/16, whose expression captivated the audiences, after which, a dance team led by IMU students concluded the performances of the evening. To further spice up the night, the nominees for prom king, prom queen, best couple and best dressed, were invited to interact with the attendees. Each of them participated in small games and funny punishments to win over the guests. The lucky draw was definitely a session no one wanted to miss! Everyone was eager to see who would win the grand prizes: an iPad mini, an ASUS laptop and an HP Inkjet printer. The excitement and anticipation grew in the ballroom as the emcees drew number after number; it was a heart-warming scene to see the students and staff interacting so freely with each other. The night came to an end as the winners were announced for each category. The hard work that the organizing committee had put in since November of 2017 had finally paid off, in the form of a whimsical evening, which carried everyone to Carroll’s famous Wonderland. 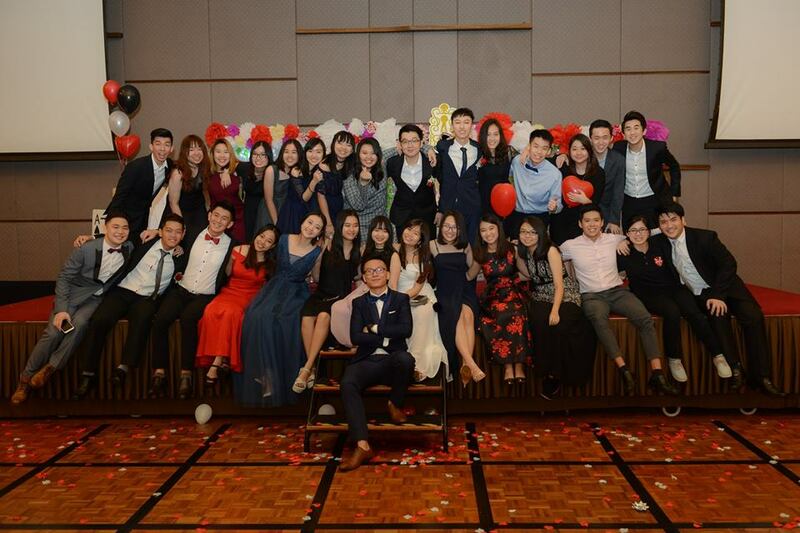 IMU Ball 2018: Le Rêverie organizing committee is signing off now. Hope to see you all next year. When it comes to death, many like to point fingers at everyone but the newly deceased. You hear irritated mutters about the incompetent doctor, the idiotic driver and the sad twist of fate. You ask yourself the question; was he/she ready to go? It’s a hard question to answer, but today, that question can be answered easily. Some countries/states have legalized “assisted suicide”, giving people the decision to quietly end suffering and ‘die with dignity’. Such an act completely contradicts the role of the healthcare system in a community, yet at the same time adds a level of control and humanity in the way we depart the earth. Here’s how it works. Simply put, a terminally ill patient above the age of 18 must make three formal oral requests for lethal medication, the second of which comes after a minimum 15 day interval from the first. There must also be a formal written request signed by two witnesses before the doctor can prescribe lethal drugs. If the request is approved, the drug is prescribed, and the patient self-administers the medication that will kill them. This “Death with Dignity” Act was approved in the state of Oregon in 1994, followed by Colombia, the Netherlands, Belgium, Washington state, Luxembourg, Vermont, Quebec, and California within the past 20 years. At the most basic level, assisted suicide defies the very fundamental principles of medicine. The social stigma associated with self-inflicted harm is already a huge issue in today’s society, and now medical professionals are offering their services to aid such a quest for death. The doctors themselves aren’t directly murdering the patient, (as the patient himself is required to administer the lethal dose) but their role is more or less equated to handing them the knife and teaching them the best place to stab themselves. Of course, the role of the doctor is to act in the best interests on the patient – but who knows best? Human life is a beautiful thing, a gift to be treasured, but sometimes that gift contains more than unicorns, rainbows and sunshine. For those unfortunate enough to draw the short straw, to continue living is a painful process and the only foreseeable gratification is death. To simplify this concept, let’s stick to the generic scenario of an end-stage cancer patient. Months of chemotherapy and radiation have cost you your strength, spirit and of course, your hair. Each round is another torturous journey holding no more hope than the desperate search for an oasis in a desert. And when you’ve decided you’d rather take the reins and you just can’t hold out anymore waiting for that miracle, that’s when you summon your doctor and make your first oral request. It’s a dignified way to die, or at least that’s what it’s being marketed as. Many would disagree, insisting that we play out the parts designed for us by our maker, silently hoping there is a miracle lurking just around the corner. For such people, human suffering is inevitable, a rite of passage each person goes through one way or another. It may be physical, mental or emotional, but success doesn’t come by throwing down the rake and forcefully kicking the bucket. We must also consider the psychological effects of contracting a terminal disease on a patient. What follows the diagnosis is often anger, frustration, feelings of helplessness and so on – all likely to predispose one to depression or at least contribute to an cloudy state of mind. Are such people in the position to make this decision that will affect not only themselves, but their loved ones? The principle of self-autonomy that all doctors learn in their first year of medical school speaks of the patient’s authority to make their own medical decisions – why shouldn’t this be included? We like to know beforehand what will happen so appropriate preparations can be made: final meals can be eaten, last farewells can be bid, last kisses exchanged and final tears shed. Of course it isn’t an easy decision, but it surely beats waiting for the three hags to snip your thinning thread. Is suicide an acceptable act? Which is more important: a doctor’s role in saving lives or a patient’s self-autonomy? even if the patient must suffer a little bit longer. For once the first cut has been made, there is no going back. The body will never look exactly as before. The heart will always show tracing of where it broke. without ever touching a scalpel. On the 5th – 7th of October, in conjunction with IMU Cup 2016, The World Spine Day committee organized and hosted the IMU Fitness Challenge and the Powerlifting Competition held at driveway and atrium respectively. Both of these competitions aim to motivate students to achieve a better physical level and to promote awareness of physical health. Pre-event involved video shooting of tutorial videos of the Fitness Challenge where it was broadcasted on a Tv at the driveway as well as on our WSD page @ Facebook. Setting up of both events took place on the 4th of October, around noon where the World Spine Day subcommittees start setting up the equipment in the atrium. Registration for the Fitness Challenge took place at 9am and ran on a first come first serve basis. The prizes (except medals) were given to the first 100 finishers. However, we did not restrict additional participants as this event is to promote and motivate IMU students to achieve a better physical fitness level. Approximately 150 participants consisting of staff and students took part in this Fitness Challenge but badges were given out to the first 100 participants. Distributions of medals were categorized into different classes: Male: Class 1 (above 75kg), Male: Class 2 (below 75kg), Female: Class 1 (above 50kg), Female: Class 2 (below 50kg) and as well as Staff: Open Category The Fitness Challenge consist of a series of 5 exercises, where participants are to complete all of the exercise in a particular order. Exercises include: 10x Burpees, 10x Chin Up/Pull Up, Crucifix Hold for 60seconds, Farmers Walk of 25metres and Standing Broad Jumps for 10metres. Crew and helpers of the Fitness Challenge consist of Chiropractic Students from CH115, CH215, and CH116. The winning house of Fitness Challenge 2016 was Phoenix, followed by Pegasus and Griffin with a total of 365 points, 330 points, 300 points respectively. Powerlifting Competition took place in the atrium for three days at 11am-3pm. This powerlifting competition consists of the same three exercises conducted internationally which are the squats, bench press, and deadlift. Students registered for this competition by submitting a video of students doing 3 repetition of squats, 3 repetitions of bench presses, and 3 repetitions of deadlifts to a IMU Powerlifters @ Facebook. The Powerlifting Competition were separated into 4 categories: Male students above 80kg, Male students from 79.9kg -70kg, Male student below 70kg, Female students above 55kg, Female students below 55kg, and Male Open (IMU Staff). Each competitor were given 4 sets to work up to their heaviest weights. These 4 sets will include the warm up for each lifts. The winning house of this year’s Powerlifting Competition was Griffin, scoring total medal points of 12 whereas Taurus and Phoenix scored a total of 8 and 7 respectively. To wrap this up, although there were several hiccups along the way in terms of shortage of weights, lack of manpower, insufficient time, clashing of classes, but overall these two events was a success because the WSD Committees and Crew took shifts and put in tons of effort to pull this two events off. We would also like to thank our overseer Mr. Alexius Cheang who have been constantly supporting us throughout the whole process by giving us suggestions and advice on how to run these two events. When there is a hole in a sock, your toes would crinkle to hide it in embarrassment. That’s how she felt at his sight; to her, he was tall in his splendour as he walks with his broad shoulders like a knight in shining armour. She wasn’t the damsel in distress in this story though, she was the character who never appeared, remained hidden underneath the stairs. He entered into her life, and made a mess of it. He did nothing, he was just present, he laid his head on the table and by chance she glanced, and to her, it was the most peaceful face she had bestowed her eyes upon. There were many things she wanted in life and she gave them all up knowing there was no good in waiting. Yet, with him, she wanted him, with every fibre of her being. Then, it started. The compulsive need to see him, to look at him from afar as if he was one of those sculptures only meant to be looked at. His name was scribbled all over her lecture notes, as her feet were anxious to run, run to places he would frequent. Suddenly, to her happiness is glancing at the door and at the very moment he entered with a bewildered face. She scavenged for every little detail she could find of him. The name, Nicholas did not roll off her tongue so easily, yet it became like a secret she would like to keep all to herself, masquerading him with a nickname. He left her in puzzlement, a set of jigsaw puzzles that she was struggling to complete. He was worth writing about, a character that only gave her questions, never providing any answers. A mystery she would like to spend her lifetime solving, from how many t-shirts he owned to ‘is their meeting a play of fate or was it merely timing’? Every time she turned her head, he was there standing with one of his many varsity t-shirts with his compulsory neutral expression. His mere existence fascinated her. There is something about him, it isn’t his looks. Well, not entirely. His slacken jawline, coffee coloured skin tone, and of course those black orbs glinting with mischief. He had this air of arrogance, of wanting to be admired, the recipient of wrath of the male population. Perhaps, it was self-assuredness, knowing he deserved only the best, and simplicity does not cut it. It couldn’t be the deep rumble of his voice, or even that slight twist of his lips; a boyish grin. She became greedy, hiding away was tiring. Yet, when she approaches, he pushes away. Even when there’s another, one who is better and warmer than him, her thoughts and her feelings would waver like the wild grasses and drift back towards him again. Her tongue tied into a knot, at the sight of him. So, she stood farther. That slight smile he had, the one he rarely showed, the one the world had not been given the privilege to view – it made her lips lift upwards in the greyest of her days. When sleep didn’t inch closer, she would lay in bed, thinking of the empty coffee cups, of filling in the blanks all those unanswered questions. She thinks of the swivelling doors, mocking as they open and close but he never appeared. She imagined how warm his fingers would feel clasped with hers as the both of them strolled along the shady gravel pathways. Perhaps, there would be a little skip and a giggle or two and smiles stretched a little too widely. Then she wondered how long she will have to endure the rain alone, with her constant disdain of the weather forecast, she would stand drenched at the train station. She thought of the days when her umbrella would fit two occupants, and their Wellington boots sloshing down the puddles. He would have a pair of blue ones, and she would wear canary yellow ones. The days when she knows her tomorrow would begin again, knowing someone would be waiting anxiously the way she always does, biting the edge of her pencil. Perhaps, she wouldn’t have to lip-sync her favourite songs. Instead she would shout it out loud without shame, both of them laughing and collapsing to the floor with tears at the corner of their eyes, clutching their stomach. Then, both of them would dance, a haphazard affair, she would step on his foot and he would wince exaggeratedly. Car rides in the middle of the night with no particular destination, only her and him and the endless road. He’s a risk that she would like to take, and to be harmed, something that she couldn’t fight with, something that in time she would only flee from. She wrote letters, inks bleeding on pieces of paper – her genuine feelings, words that she couldn’t muster to say to him, the ones which died at her throat. She sealed each with determination, walking up to him that one day, with an envelope in her hand. She couldn’t do it, he who was always under the spotlight deserves a leading lady and she didn’t see herself as that. The letters were ripped apart with angry tears rolling down her cheeks, her time was up as he took the airplane leading him to his dreams. She could only smile at the thought of him, his smile, his boisterous laughter when he met his friends, how he would always walk around with his eyes focused on his mobile phone, how in those limited seconds she had in hand she could tell him apart from the crowd and even in the years to come, she could separate him from the rest; this was her consolation, of a story unwritten, of unsaid words. To him, maybe she is no one, but to her, he was someone who mattered. At the sound of kettle screeching. Window panes witnessing the raindrops running. My warm cup of coffee with its smoke wafting. The Merdeka Day celebrations were held at IMU on the 29th and 30th August 2016 organized by the SRC, the SSH and the Cultural and Religious Societies of IMU. Being the sole chairperson of this event and the Cultural and Religious Representative of IMU it was great to have an opportunity to pull together all the clubs under me and give them a common goal of making Merdeka Day festive at IMU! On the 29th of August we had a short ceremony to start off the Merdeka Festivities. Mr Sara from the SSH gave out prizes to the winners of the competition organized by the SSH and it was followed by performances by Yuvithra from the Hindu Society and Daniel and his group from the Music and Performance Society. The SRC shared some fun-facts on Malaysia while dressed in National attires and I gave out the final vote of thanks. Free chocolate and banana muffins from Mad Alchemy were given out to all those who attended the short ceremony. The atrium was filled with flags and balloons decorated by the Choir club and the Japanese society and a board with important facts on Malaysia was done by the Chinese Society!The Buddhist society organized a fun photo-booth at the atrium with an Instagram challenge and the Christian Fellowship sold tasty Malay food for all to enjoy! Upstairs near the library the Korean society showed us their culture with a booth dedicated to selling Korean food and the Catholic Society sold tasty Chinese food for all! Merdeka Day symbolizes much more than the right to be independent from foreign rulers. It symbolizes the unique Malaysian inclusion of all cultures and acceptance of our differences. Malaysia is a country which truly believes in diversity being its strength and Merdeka Day was a time in which the cultural and religious clubs showed their spirit for this nation by means of support to this event. As the future professionals of Malaysia Merdeka Day is a good time to ask not what your country can do for you, but what you can do for your country! I’m grateful to all Malaysians who continue to show this Sri Lankan girl a lot of love and make me feel at home here at IMU and in Malaysia! Happy 59th birthday, Malaysia and Happy Merdeka Day to you all!